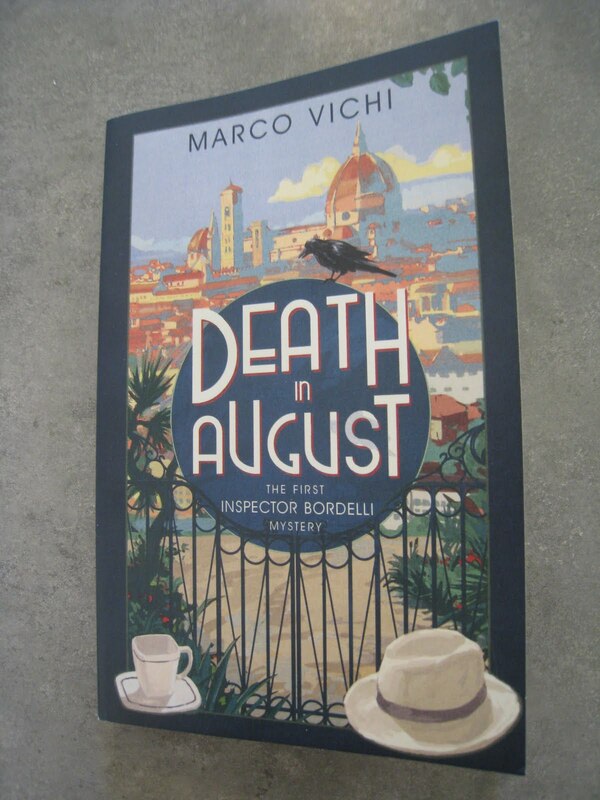 The Little House of Concrete Bookshelves: Marco Vichi "Death in August"
While it's always good to get in on the ground floor and start off a crime fiction series right at the beginning, there are certain side issues that emerge alongside the pleasure of making a new and interesting discovery. 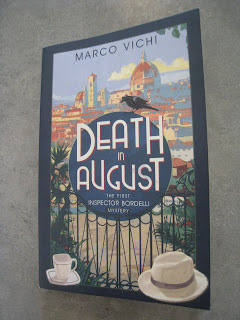 In this case, having read and enjoyed Marco Vichi's Death in August those issues include the fact that Vichi's work is translated into English by Stephen Sartarelli, whose regular translation gigs include Andrea Camilleri's Montalbano series. While it was Sartarelli's presence in the background that drew my attention to Death in August endorsements from, among others, Andrea Camilleri had a bit to do with the order going in, along with references to Florence and food. It certainly seemed like a promising combination. It's mid-summer in 1963 and with most Florentines away on holidays there isn't a lot to keep Inspector Bordelli occupied. An elderly wealthy woman isn't answering the phone but the bedroom light is still on, so her daytime companion contacts the police around midnight. The Signora is one of those people who take their own security seriously, so the companion doesn't have a key to let herself in and investigate matters for herself. The companion's sure Signora Pedretti has been murdered, so while it's the middle of the night Bordelli, suffering from heat and incessant mosquito attacks, heads for the house in the hills above the city, and finds the Signora's body in bed, apparently the victim of a severe asthma attack. She had, Bordelli learns, a violent allergy to a particular strain of South American pollen, though a double dose of her medication should have been enough to save her. Things, however, don't quite add up. While there's apparently untouched asthma medication on the bedside table, and some in the mouth a number of inconsistencies turn up in the autopsy to suggest foul play. The question is how anyone could have committed murder without a set of keys or access to the house. It becomes, in other words a how rather than a whodunnit, and while he's pondering how to prove his suspicions in court, with little in the way of official duties to occupy his time, Bordelli becomes the mentor of a Sardinian recruit whose father was Bordelli's comrade in the Resistance during World War Two. Recollections, reminiscences and flashbacks to wartime action take up a substantial part of the story. When he's not reminiscing about wartime experiences, his childhood sexual awakening and the ins and outs of the matter under investigation, Bordelli's planning a dinner party for the circle of acquaintances that will presumably become regular characters as the rest of the series unfolds. As with all these series, it's the background cast that provide the basis to keep the reader interested, particularly when there's not a lot happening as far as the investigation is concerned. Some of them are, more or less, predictable. Piras, the Sardinian recruit looks like the inevitable off-sider and sounding board, while we also encounter the regulation quirky pathologist. Quirky pathologists seem to be de rigeur for any self-respecting crime series and crusty curmudgeon Diotivede fits the bill to a pathological T.
There would, one suspects, also be an on-going place for the victim's brother around the dinner table which may prove to be one of the centre pieces of the series. Some of the supporting characters who end up around the table for the drunken dinner that supplies the inspiration Bordelli needs to crack the case are less predictable. Bordelli has an idiosyncratic attitude to law enforcement and a sympathy towards people who steal to feed themselves that's bound to create on-going issues with his superiors, so it probably comes as no surprise to learn several of his closest acquaintances are petty criminals. There's an ex-convict with extraordinary culinary skills, a semi-retired petty thief who turns out to be a useful odd job man, and a retired prostitute. As the basis for an on-going series it's a cast that works rather well. While it only runs to a tad over 200 pages (the volume's padded out with a chunk of the sequel, a fact that obscured the Translator's Notes we've come to expect where Santarelli's involved) Death in August is substantial enough to establish Bordelli as a figure worth following. He comes across (at least to this reader, as in all cases your mileage may vary) as a likeable, idiosyncratic maverick, not a million miles from Andrea Camilleri's Montalbano in his social and political leanings, with a wartime background that should be a significant element as the rest of the series unfolds and offers all sorts of possibilities. He's compassionate, conscientious enough to see things through to the end, quite willing to take short cuts where necessary but inclined to keep hammering away until someone cracks where the short cut doesn't exist. Having stated that it was Stephen Sartarelli's presence as translator that brought me to the series, while the story lacks some of the dialect issues you'd find with Camilleri and Catarella, the translation reads smoothly and there's little to indicate that the story wasn't originally written in English. He's a class act. The second in the series, Death in the Olive Grove isn't due out in hardback until January next year, and based on the relative slimness of Death in August I'd be inclined to wait for the paperback for $15 from Fishpond, rather than the $22 they're asking for the hardback pre-order. Still, with the US paperback of Camilleri's The Potter's Field out later this month I'll have something to fill in part of the wait.